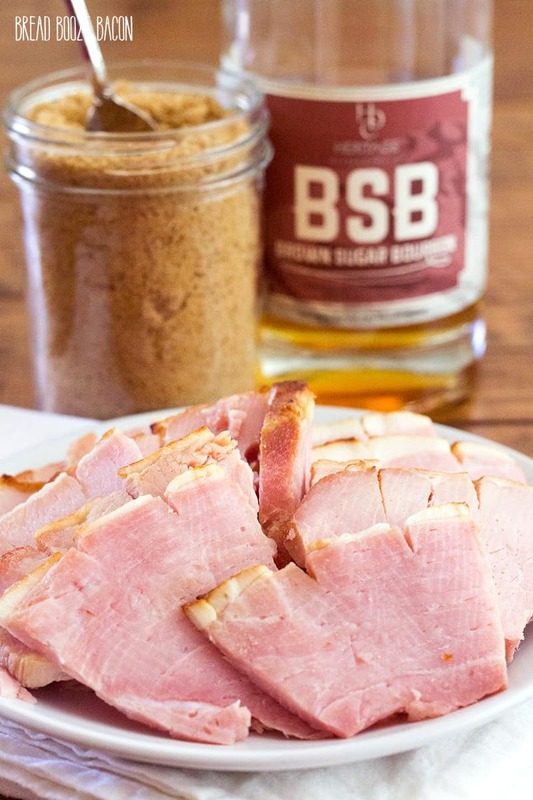 This easy Brown Sugar Bourbon Ham is the best way to celebrate with your family! 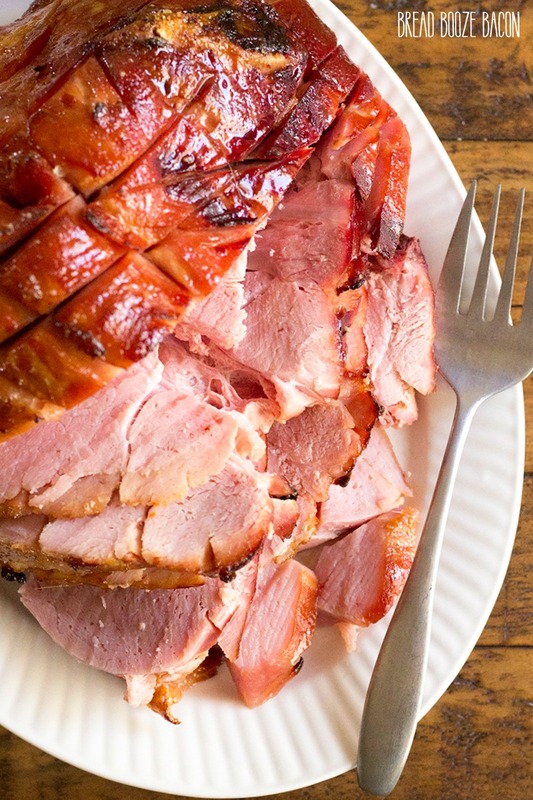 This ham is full of flavor and just as good from the fridge as it is right out of the oven! Are you guys ready for this? Today I’m taking on my first holiday ham and boy is it a doozy! 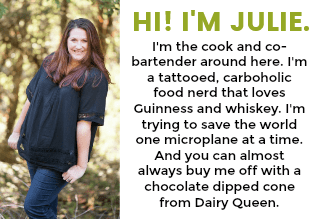 I wanted to do something simple and classic…and a little boozy. So here we are, making a brown sugar bourbon ham! Now, I went with a bone-in smoked ham, not the spiral sliced kind you get from some places. I love the rustic, home-style look of a ham that’s scored and roasted. Not to mention I can cut my slices thicker with is great when I’m reusing leftovers in other recipes. But if you prefer a spiral-cut ham, that’s okay too. Whatever works for your needs. 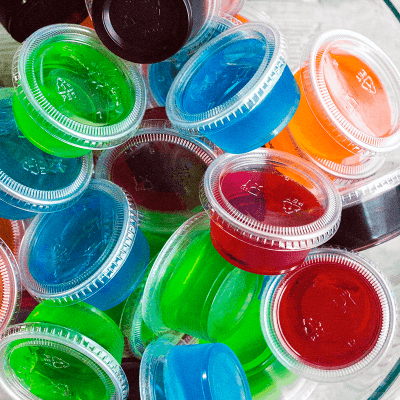 The key to this recipe is the bourbon. It marries together the sweet, rich brown sugar with the tangy Dijon mustard beautifully. I ever went so far as to snag a bottle of Heritage Distilling Brown Sugar Bourbon for this recipe. This bourbon is pretty amazing all on it’s own or over ice, but I couldn’t help myself when it came time to make this ham. Double brown sugar sounded like a winner to me. If your can’t find brown sugar bourbon, any good bourbon you like would work well. I couldn’t keep my husband away from this ham. The second it was cool enough to get his hands on he was picking at it. I’d even catch him just before dinner dipping into the fridge to rip off a piece of ham. Total winner in my book. 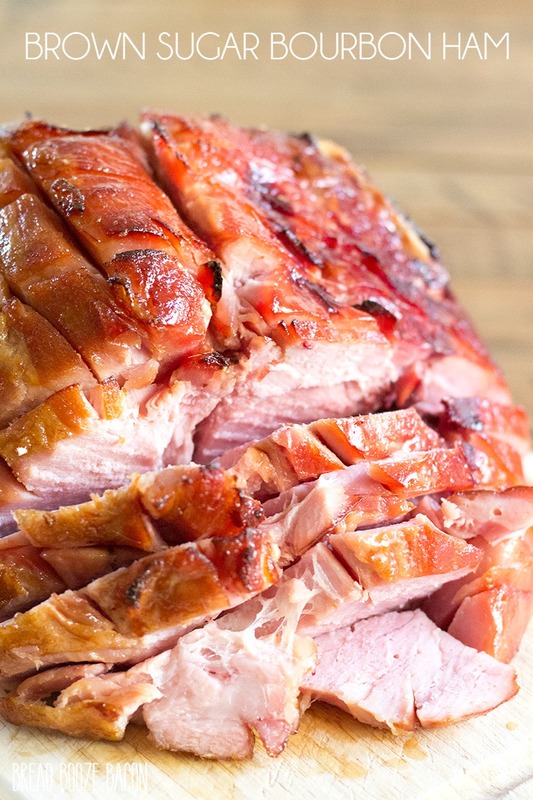 This holiday ham recipe will be a showstopper at your dinner table for Christmas and Easter. Serve it up along side Grandma’s Mashed Potatoes, Creamed Corn Casserole with Peppers, and French Onion Sour Cream Biscuits and you’ve got a meal that’ll having everyone asking for seconds! Unwrap the ham and place it down on a cutting board. The skin of the ham should be up, facing you, while the cut side showing the meat should be down. Use a sharp knife to score the entire surface of the ham, cutting down about 1/2-inch into the skin. Score evenly spaced lines all over the ham in one direction. Turn the ham 90 degrees and score even lines again to create a diamond pattern. Place the ham on a roasting rack with the scored skin facing up, and then place in a roasting pan. Bake for 1 hour. In a small mixing bowl, stir together the brown sugar, bourbon, and mustard with a fork until well combined (be sure to break up any sugar lumps). Carefully remove the ham from the oven. Use a pastry brush to glaze the ham with half of the brown sugar mixture. Be sure to get in all the nooks and crannies and go over the whole ham a couple of times. Return the ham to the oven and bake for 30 minutes. Remove the ham from the oven and glaze with the remaining half of the brown sugar mixture. Bake for 30 more minutes. Remove the ham from the oven. Transfer to a cutting board, and cut the ham into slices of your desired thickness. If you can't get your hands on Brown Sugar Bourbon, you can substitute whatever bourbon you prefer. Woodford Reserve and Buffalo Trace would both work well in this recipe. 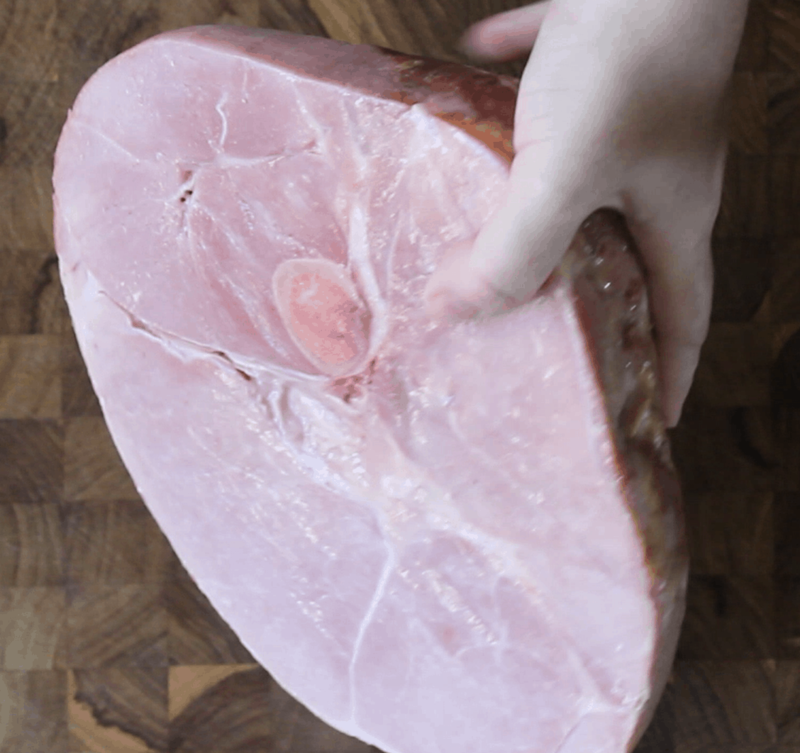 If you buy a spiral cut ham, you do not need to score the outside of the ham. 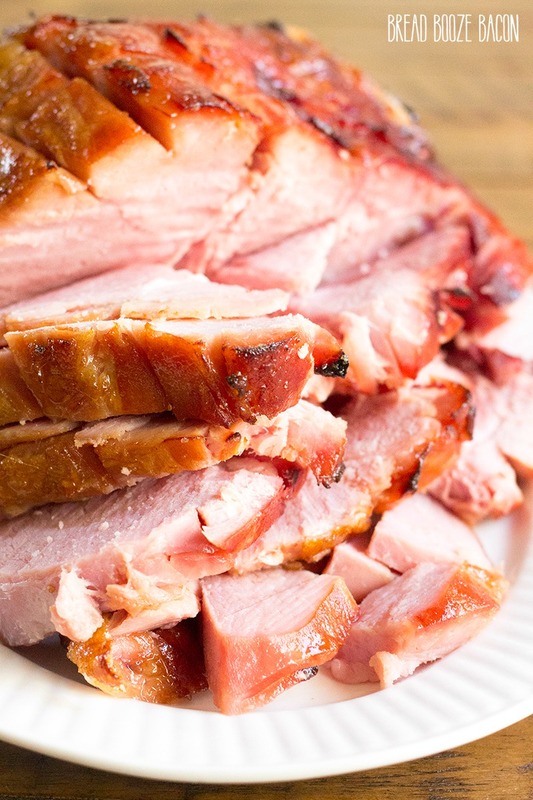 As a general rule, you want to cook the ham for 15 to 20 minutes per pound. Please adjust your cooking time accordingly for the size ham you purchase. What is brown sugar bourbon?? How long would I heat/cook a ham in a crockpot with this recipe? I’m pretty sure the spiral cut I just bought is precooked so I’d just be heating it, so a couple of hours on low, maybe? Hi Cindy! You’d want to place the ham (7-10 pound) flat side down in the crock pot and cover with the glaze. Place the lid on the crock pot and cook for 4-5 hours on LOW. Baste the ham a couple times during the last hour. Hope this helps! YES -thank you so much!! Exactly what kind of ham (brand?) did you use in the picture? I like the look of it…texture wise, but I don’t see a bone. It looks like a round shaped boneless ham. Hi RoxyLynne! It’s a Smithfield ham. There is a bone in the ham. The bone is facing down in the video and pictures. I couldn’t get the darn thing to sit up nicely with it showing. 🙂 Here’s a still shot from the original video footage showing the cut side of the ham with the bone for reference. Hope this helps!! 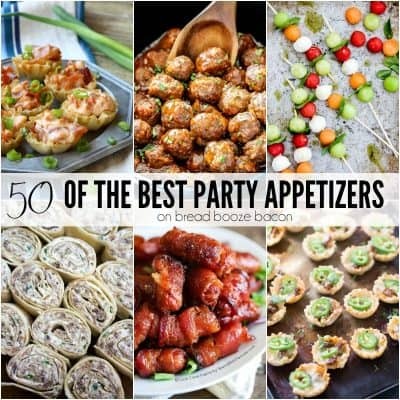 Since you did not cook the 2nd glazing, you are serving alcohol to whomever eats it. Either put all glaze on the first time or use a saucepan, add water to the leftover glaze, and cook off the alcohol on the stove top.